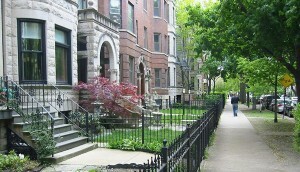 The Chicago neighborhood of North Center, officially Community Area 5, encompasses the neighborhoods of Northcenter, Roscoe Village, St. Ben’s and Hamlin Park. North Center is bounded on the north by Montrose Avenue, the east by Ravenswood Avenue, the south by Diversey Parkway and by the Chicago River on the west. The area is well served by the CTA‘s Brown line with stops at Addison, Irving Park and Montrose as well as many bus and bicycle routes. North Center is home to some of Chicago’s most highly rated public and private elementary and high schools. Alexander Graham Bell Elementary School, located in the St. Ben’s neighborhood, includes a neighborhood K-8 school as well as a Regional Gifted Magnet School and a school for the deaf. North Center is also the location of two private Catholic schools, St. Benedict’s and Gordon Tech College Prep, in addition to CPS’ Lane Technical High School, the alma mater of Michelle Obama. North Center not only hosts a number of popular festivals but also has a variety of parks and entertainment venues including an indoor ice arena, a children’s splash park, bowling alleys and a public swimming pool. 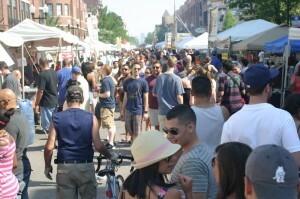 The Roscoe Village neighborhood hosts the summer festivals Retro on Roscoe, Oysterfest and Burger Fest. Fall and winter festivities include Halloween Parade and WinterFest. North Center also features Chicago’s Ribfest, a meat eaters paradise that attracts crowds of more than 55,000 people over three days. In the 1870’s, North Center was only accessible by the Chicago River and what is now Lincoln Avenue but today is home to retail shops, well known restaurants, live music and theater venues. Early in the 20th century, North Center was home to the Selig Polyscope Company, the creator of many of America’s earliest movies. Selig’s studios and offices at Byron Street and Western Avenue are still being used today as residences and retail shops.